Another two for one “things I like” today. 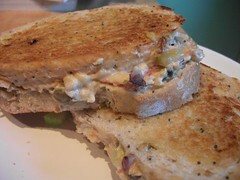 I’d never really made a panini until I started testing for Tami’s American Vegan Kitchen. The first time I made the tuna no melt panini pictured above I had to create a DIY panini maker from a frying pan, tin foil and some old unused floor tiles. This worked out well even though it was a bit messy and precarious. I carried on making panini that way until I finally snapped and bought a proper panini maker. (I say finally snapped but if you know me at all you’ll guess that what I really mean is that I realised there was a kitchen gadget out there that I didn’t own and ordered it). I bought this Gordon Ramsay grill – not because I’m necessarily a huge fan of his (though he’s miles better on any UK production than on US ones), but because I wanted something flexible with interchangeable ridged and flat plates. I’ve already used it enough to justify its place in my kitchen – in fact, it got upgraded from a “lives in the garage” appliance to a “lives in the kitchen” appliance extremely quickly. It would be worth the price just for sandwiches and quesadillas, but you can use it for other things such as grilling vegetables or kebabs. For those of us living in countries with grim weather it makes us feel all Australian or American to throw something on the grill! On to the panini. Not only did I have to construct my own grill the first time I made it, but I had to use chickpeas because I didn’t have access to soy curls. I really enjoyed it with the chickpeas, but having brought some soy curls back from America I was able to use the curls this time. I haven’t included soy curls in my MoFo “Things I like” theme, because to be honest the jury is still out. I’ve only used them once before and I wasn’t quite convinced (I’ll probably blog it once MoFo is over), but in this application I really like them. The texture is excellent and they combine perfectly with the other flavours. The cheezy mayo which goes into the sandwich to create the melt effect is amazing and regularly crops up in my kitchen on burgers, sausages and as a dip for potato wedges. 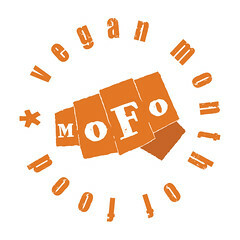 This entry was posted in American Vegan Kitchen, Veganmofo 2010 and tagged Veganmofo 2010 by efcliz. Bookmark the permalink.